Natural Swimming Pools (NSP’s) or Swim Ponds have become a phenomenon across much of Western Europe. Dozens of companies are actively promoting this hybrid form of a swimming pool and public enthusiasm for NSP’s is increasing every year. In Europe, this technology has been proven and is in wide use. In Germany and Austria there are many public NSP’s that service in excess of 4000 visitors a day. German Water Purity Standards are extremely strict, these pools have been regularly tested over years of use and found to be completely safe. 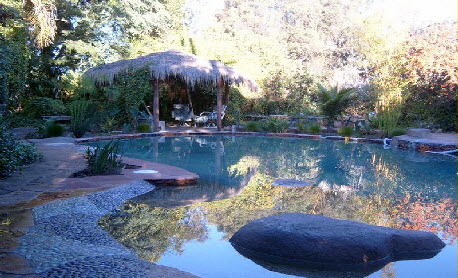 Expanding Horizons is the only company in California actively promoting this alternative to a chlorinated swimming pool.